New York City has reached an affordability crisis of unprecedented proportions. Brooklyn has officially become the most unaffordable housing market in the country. Homelessness has reached its highest levels since the Great Depression, and uncounted thousands from low-middle income communities and communities of color are being displaced. Our mission: turn this city of injustice into a City of Justice. We invite you to an evening where we’ll imagine 2016 and a future where social justice is realized with participatory art-making activities, poetry, writing, story sharing, theater, body movement and more! As you enter this space you can map your story onto the larger story of loss, struggle, change, and hope. You can connect with others, listen to their words, and express your own through poetry and rhymes. Leave armed with info about housing rights and how to get involved. Then stay in touch! Let’s create a New York City for all, together. 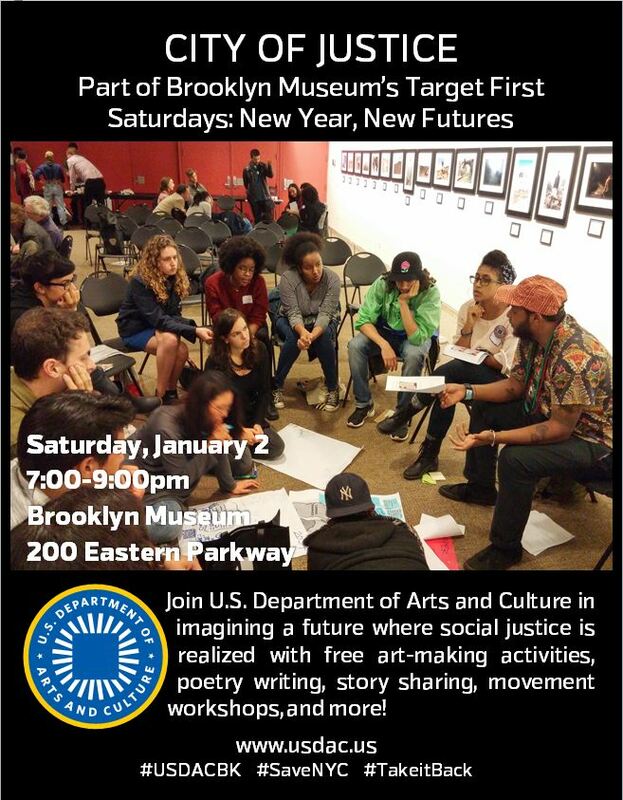 This event is part of the Brooklyn Museum’s “New Year, New Futures” Free First Saturday and is organized by the USDAC NYC Field Office. The Planning Team includes Betty Yu, NYC Cultural Agent; Bridget Bartolini and Nadia Mohamed, Field Office members; and local NYC artists, cultural workers and activists who have teamed up to facilitate participatory imagination stations. See photos from “City of Justice” HERE.